Today I had the pleasure of eating brunch with a good many of my dear friends and coworkers. 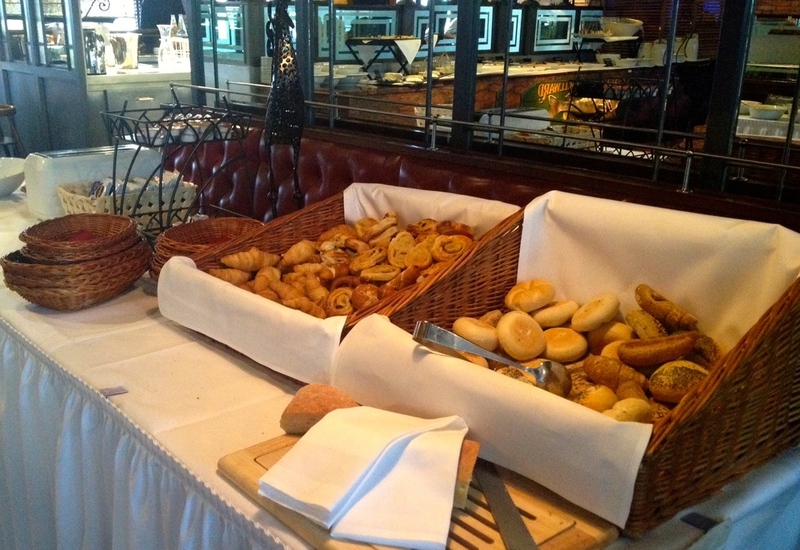 We decided to convene before the official start of the school year at our second annual Sunday brunch at Pier 51. Why Pier 51? Their brunch is one of the few "American-style" buffet brunches that I've found in Stuttgart, and while it is a bit pricey at 32€ per person (half price for children), I think we generally eat our money's worth given what's offered. When you pay for the Sunday brunch, you get a good many choices including breads and toasts with butter and jam; yogurt and milk with many different kinds of cereal and müsli; fresh-squeezed juices, teas, and coffee; a hot buffet with bacon, sausages, eggs, waffles, and pancakes; and, my favorite section, a cold buffet with sliced meats and cheeses, smoked fish, grilled vegetables, salads, and other antipastos. The price of the buffet also includes one glass of Sekt (sparkling wine). And if you go early (around 11 am) and stay long enough (around 1 pm), they switch the hot buffet from breakfast to lunch, so you can help yourself to an additional array of pasta, vegetables, rice, fish, and meat along with a dessert table with fruit and mini-cups of various sweets. On this particular day I began with a plate of antipasto, including goat cheese, blue cheese, a couple different kinds of German sausages and salami, smoked trout, smoked salmon, vitello tonnato (sliced veal in a creamy tuna-flavored sauce), melon and prosciutto, tomato and mozzarella, and roast beef with horseradish sauce (which I had two servings of it was so good). From salty to creamy and sweet, each bite brought with it an explosion of flavors. The food was of an excellent quality, as well, with fresh fishes and clearly homemade sauces. For my second plate, I chose to go with some breakfast comforts, including crispy bacon (a rarity sometimes in Germany where it tends to be cooked on the limp side), scrambled eggs, pancakes and waffles with real maple syrup (also not entirely common), and a mango-pineapple juice. I was a little surprised by the waffles, which had a crunchy sugar crust. I can imagine they would have gone well with a scoop of vanilla ice cream on top as a dessert. About the time lunch came out, I decide to see if there was anything tempting. In the end, I skipped the savory stuff and came back with a plate of dessert, including some fresh fruit, a mango-passion fruit pudding topped with a tiny chocolate cake square, and some kind of creamy citrus panna cotta. The pudding and panna cotta were clearly homemade, and I finished every bite. I probably could have eaten another plate, but I didn't want to stuff myself today. Instead, I sat around with my friends and we chatted over coffee for a while. The staff never rushed us out, and continued to pour coffee and refill water when we wanted it. They were very attentive today, and even spoke English to all of us (since we were all speaking English ourselves). I'm also very grateful at the ease with which I was able to make a reservation (for 16 people, nonetheless!). I simply emailed them my requested number of people and our time, and they replied with a confirmation. Paying was also quite easy, as each person was able to pay at the front when they were ready to leave, meaning there was no hassle at the end of the meal over a large check. 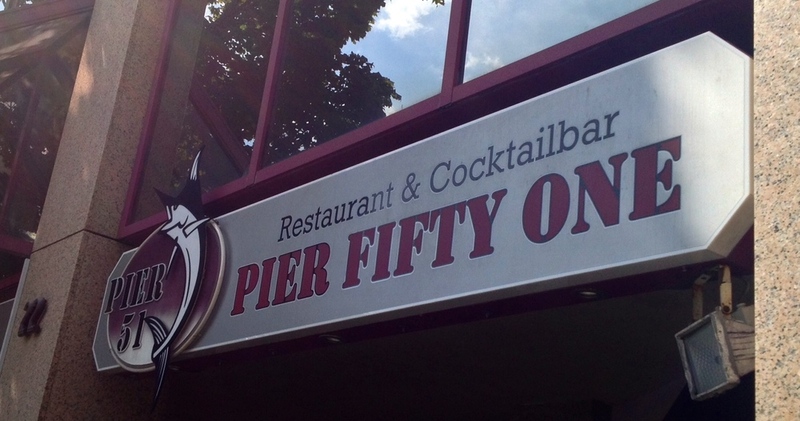 In fact, I've been to Pier 51 on many occasions as it's between work and home, and they have a lovely bar with half-priced cocktails every day during happy hour from 5-7 pm. Their cocktail list is, I think, one of the best in Stuttgart, ranging from the usual gimlets and cosmos, to the unusual mango martinis, "Watermelon Man" (vodka, watermelon liqueur, lemon juice, pineapple juice, and orange juice), and "Creamy Passion Fruit" (rum, grenadine, pineapple juice, passion fruit juice, and cream). Most of the cocktails are between 7€ and 11€, so the 5,50€ happy hour is definitely a good deal. Their daily menu has a very American-International flair with steaks and seafood, including whole lobsters from their lobster tank. I haven't yet had a steak there, but I have dined in the bar during happy hour on several occasions. I rather like their burgers, which, while still not quite American-style burger patties, are some of the closest you can get to one in Stuttgart. They are big, messy, and come with a fantastic BBQ sauce and french fries. I also really like the Caesar salad, another rarity in Stuttgart. Pier 51 is located in Degerloch, just across the street from the Degerloch u-bahn and bus station. They are open for lunch and dinner (with a break in between) Monday thru Friday, plus Saturday dinner, and Sunday brunch and dinner (also with a break in between). I highly recommend you check out their brunch and their cocktail happy hour, and sit out on their lovely back patio when the weather is nice. You can even follow-up your meal with one of my favorite walks down the Weinsteige.